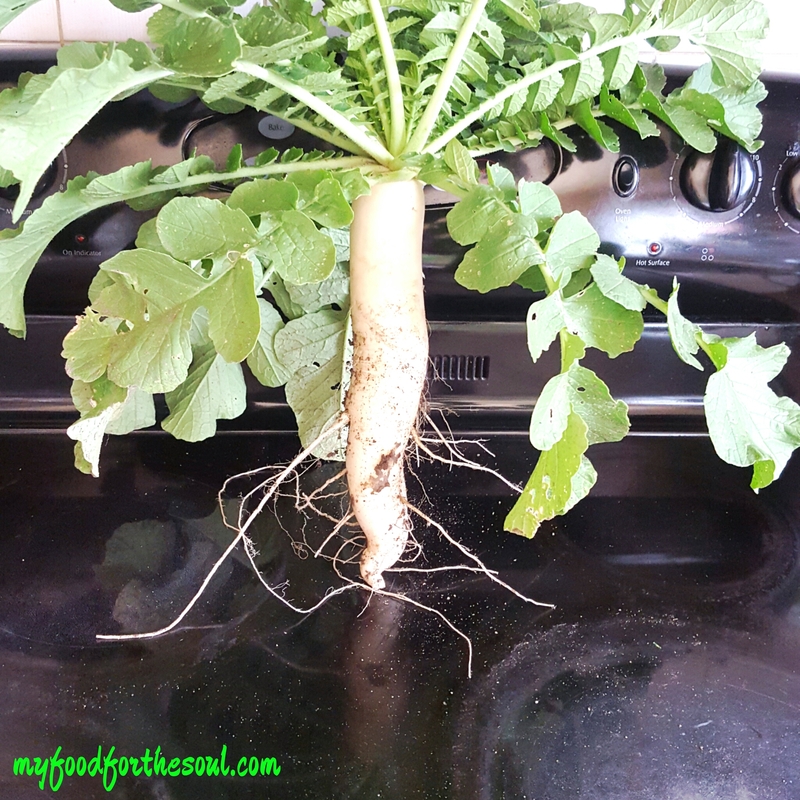 Don’t toss those Radish Greens ! Our passion (that’s me and my husband) for gardening is completely unconditional. During the summer days we, but more so my husband spends a lot of time in our wonderful garden keeping it well maintained and weed free so we all can enjoy fresh home-grown vegetables. Well, this wonderful absolutely healthy and delicious subzi (curry) is made from a home-grown vegetable called Mooli (White Radish or Daikon). 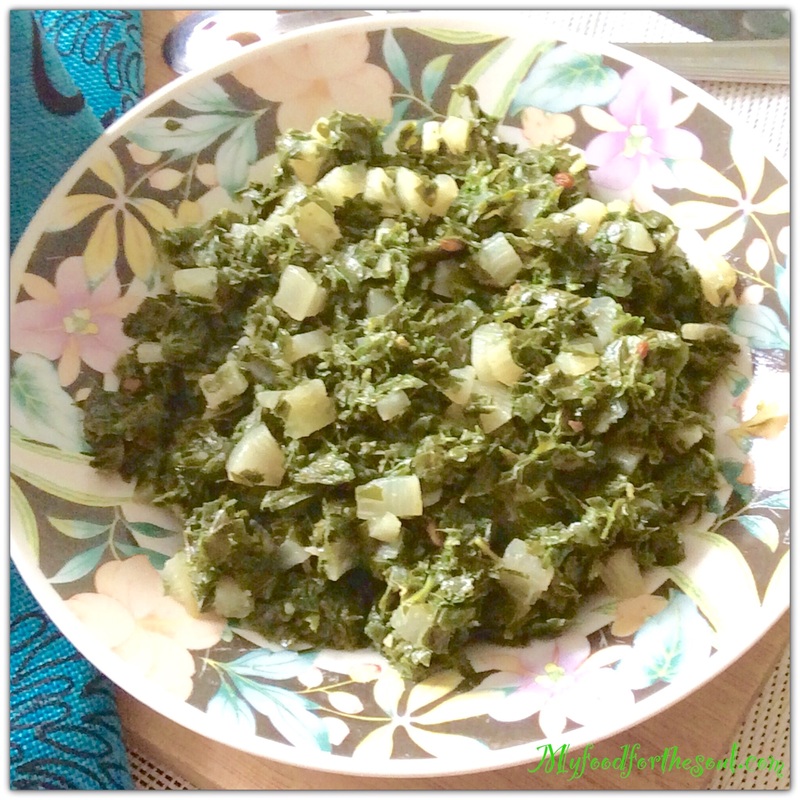 This dish is simply delicious, very healthy, absolutely easy and simple to make. It’s made with only fresh ingredients, things that are normally always in our kitchen like green chili, garlic, ginger, methi (fenegreek seeds) and salt. Really! that’s it. Super simple and cook time is no more than 20 minute. White Radish also known as “Mooli” in Hindi or “Mura” in Gujarati, it also has many different names that its known around the world. This is one of those unpopular vegetables that might not top many people’s list. Once this vegetable has been cut, shredded or sliced it seems to leave a little bit of an odd smell lingering around which could be unpleasant at times …..especially if you’re not use it. The way I see it look past the shape, size or smell of this vegetable and focus on the absolute important factor that is it’s health and nutrition benefits. Mooli (radish) consumed raw, cooked or even add into a salad is super healthy. It helps regulate blood pressure, is also very beneficial when suffering from cold or cough, helps breakdown mucus in the throat. Some research has shown that it may help with weigh loss cause it’s low in calories and a fibrous vegetable. There are many different reasons that show this vegetable is an excellent source of nutrients. No vegetable should go to waste, that’s why I say “Don’t toss those Radish Greens”. The leafs of the radish with the actually white radish make any excellent dishes. I love to make this especially for my kids, it’s full of iron and vitamins which is very important in the growth of our children. 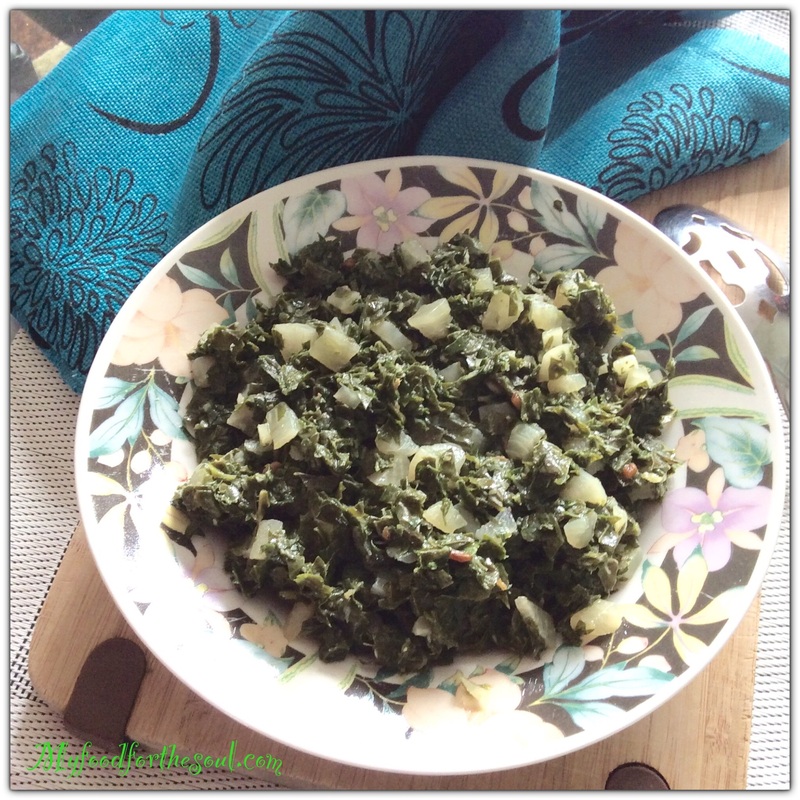 Radish leafs (mooli ke patte) are so versatile they can be adapted just like any other green leafy vegetable. Make subzi (curry), use it in parathas, include it in a salad or add it to some lentils (dal) to add that extra protein factor. My husband is completely in love with Mooli. Any dish made with mooli he enjoys….his all time favorite is pickling it with salt and lemon juice. He loves tasty, but simple food. He tells me that food should be enjoyed with its natural flavor and taste. Any vegetable that I cook I don’t like to overwhelm it with lots of spices, we both like to get the actual taste of the vegetable and keep the nutrition alive. Bhaji Mooli nu Shaak or Bhaji Mooli ki Subzi is great dish to enjoy for breakfast, lunch or dinner. 1 large White radish - peeled and chopped into finely small pieces. Break off and separate the radish leaves. Discard the thick stem.Wash well to remove all grit. Holding a handful of greens at a time, cut crosswise at 1/4 inch intervals, chopping up finely. Put in a bowl. Wash the radish and discard their tails.Peel and chop into finely pieces. Heat oil in a large pan, skillet or karhai over medium-high heat. 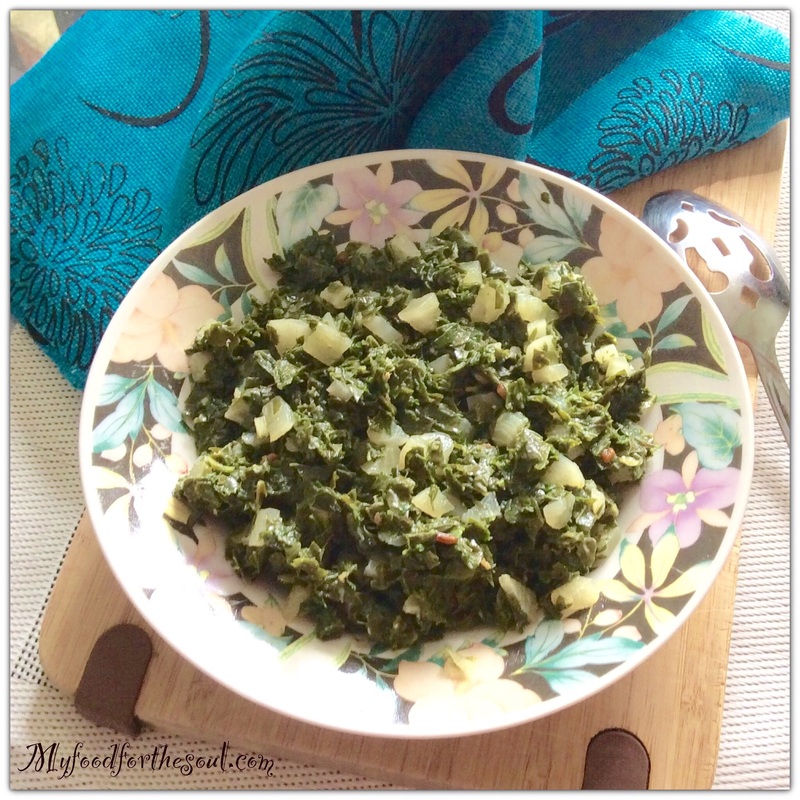 When hot add in methi seeds (fenugreek seeds), saute for 10 seconds, then add in asafitida. Uncover and do a taste test and adjust. Turn up heat and boil away any liquid that may have formed. Serve hot with your favorite side dish of roti or rice. Don’t forget to subscribe to my blog via email for great updates, newsletters and never miss a posting on some great interesting and delicious recipes.